A rib eye is a cut of beef taken from the rib section of the cow, while a sirloin is taken from the rear back portion. Both cuts are high in protein, fat, and several vitamins and minerals. Sirloin steak is generally healthier, however, because it contains a greater amount of protein, vitamins and minerals, with much less total fat and saturated fat, and slightly less cholesterol. A 3.5-ounce serving of broiled rib eye steak contains 249 calories, while a similar-size serving of sirloin steak contains 183 calories. Calories provide energy to the body to fuel metabolism and physical activity. Most adults need at least 2,000 calories a day, so a 3.5-ounce serving of rib eye and sirloin steak contain about 13 percent and 9 percent of a typical adult's minimum daily caloric needs, respectively. A rib eye contains more calories primarily because of its increased fat content. A 3.5-ounce serving of broiled rib eye steak contains nearly 15 grams of fat, while a 3.5-ounce serving of sirloin steak contains just under 6 grams. Similarly, a rib eye is much higher in saturated fat, with 5.7 grams per 3.5-ounce serving, compared with the 2.2 grams in a 3.5-ounce serving of sirloin. Rib eye and sirloin steaks contain similar amounts of cholesterol, with 89 and 82 milligrams per 3.5-ounce serving, respectively. Fat is an essential macronutrient, and most adults need between 44 and 78 grams of this nutrient per day. Saturated fat is unhealthy and can increase the risk of heart disease. A 2,000-calorie diet should consist of less than 16 grams of saturated fat, according to the American Heart Association. Cholesterol can be unhealthy in high doses, and most adults should limit cholesterol intake to 300 mg a day. Both rib eye and sirloin steaks are abundant in protein -- a nutrient responsible for tissue growth and repair. A 3.5-ounce serving of rib eye steak contains about 27 grams of protein, while a sirloin steak contains about 31 grams per 3.5-ounce serving. Adults typically need a minimum of 50 grams of protein each day, so a serving of either rib eye or sirloin can provide greater than 50 percent of an adult's daily protein needs. Both rib eye and sirloin steaks contain 10 minerals, and are particularly high in phosphorus, zinc, iron and selenium. A 100 gram serving of rib eye contains about 30 percent of the daily value for adults for phosphorus, 50 percent for zinc, 22 percent for iron and 54 percent for selenium. A 3.5-ounce serving of sirloin steak contains about 35 percent of the daily value for phosphorus, at 57 percent for zinc, 20 percent for iron and 65 percent for selenium. Beef's greatest vitamin contribution is its B vitamin content. B vitamins help convert nutrients -- primarily carbohydrates -- into energy the body can use. B vitamins also help maintain blood health and immune system function. 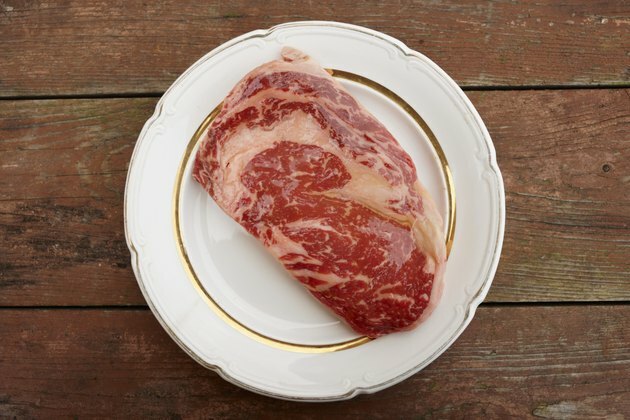 Rib eye and sirloin beef is particularly high in the B vitamins niacin, vitamin B-6 and vitamin B-12. A 3.5-ounce serving or rib eye steak contains about 50 percent the daily value for adults for niacin, 44 percent for vitamin B-6 and 67 percent for vitamin B-12. A 3.5-ounce serving of sirloin steak contains about 58 percent of the daily value for adults for niacin, 51 percent for vitamin B-6 and 71 percent for vitamin B-12.